The Hatton Children living in Bedford. Frederick, Lois, Edward and Walter. Visiting Captain Horace Walter Smeathman Hatton on behalf of the Bottesford Parish WW1 Centenary Project on the 8th July 2014. 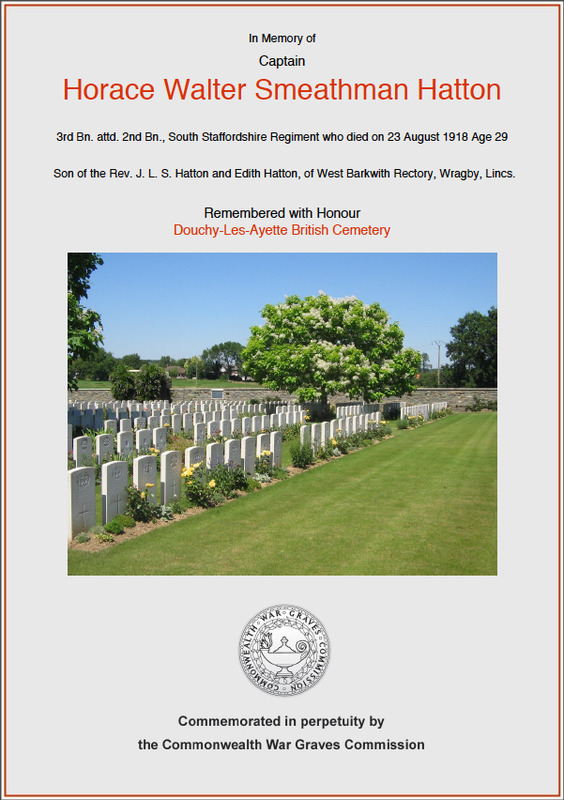 Horace Walter Smeathman Hatton was born in 1889 in West Barkwith, Lincolnshire and was killed in action with 2nd Battalion, South Staffordshire Regiment on 23 August 1918 aged 29. He is listed on the Bottesford War Memorial in St Mary’s Church. His parents were John Leigh S. Hatton and Edith Martha N. Hatton (nee Hammerton). John Hatton was the rector at West Barkwith and the household included 5 children ( John, Edward, Frederick, Lois Caroline and Walter), servants as well as a nursery governess. The eldest son John was 25 and a demonstrator in physics at Oxford when Walter Hatton was two years of age. The Rev. Hatton’s first wife had died. There were three children from that marriage – John (1865 -1933), Francis (1867-1898) and Charles (1872-1932). Walter Hatton’s mother, Edith, was John Hatton’s second wife. The Reverend Hatton died in 1894 after 12 years as the Rector in West Barkwith. By 1901 Mrs. Hatton and her family were living at 32 St Michael’s Road, Bedford. 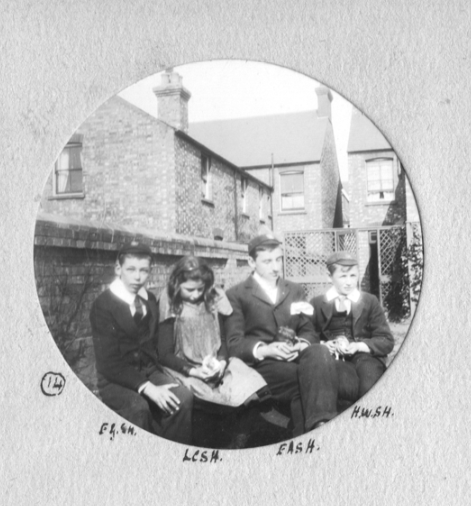 There were four children at home – Edward, Frederick, Lois Caroline and Walter. The family was living on private means and according to Walter’s subsequent Army Records he attended Bedford Grammar School. The 1911 Census records Mrs. Hatton as living at Avondale, 50 Wellesley Road, Wanstead Essex with Frederick Gordon S. Hatton, aged 24 (working as a company clerk), Olga L. Peel Yates, aged 23, from St Hellier and registered as a student and Elizabeth Chew, a general servant aged 51 who had been with the family in West Barkwith in 1891. H. Walter S. Hatton is not listed as living with the family in the 1911 census. However, ship’s records show that Mr. H. W. S .Hatton left Southampton, England for the Cape on 5th February 1910 on the Galeka, a ship belonging to the Union-Castle Mail Steamship Co. Ltd. He travelled in Third Class and the entry next to his name was B.S.A.P. – British South Africa Police. 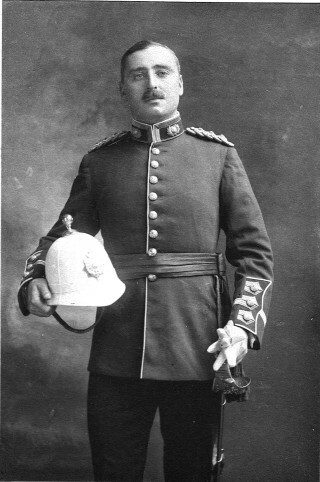 Walter Hatton served for 4 years in the British South African Police Force in Rhodesia. He then joined the British South Africa Civil Service. A letter from his brother John R. S. Hatton, Principal of East London College (University of London) supported his application for a commission stating that he was of good moral character. 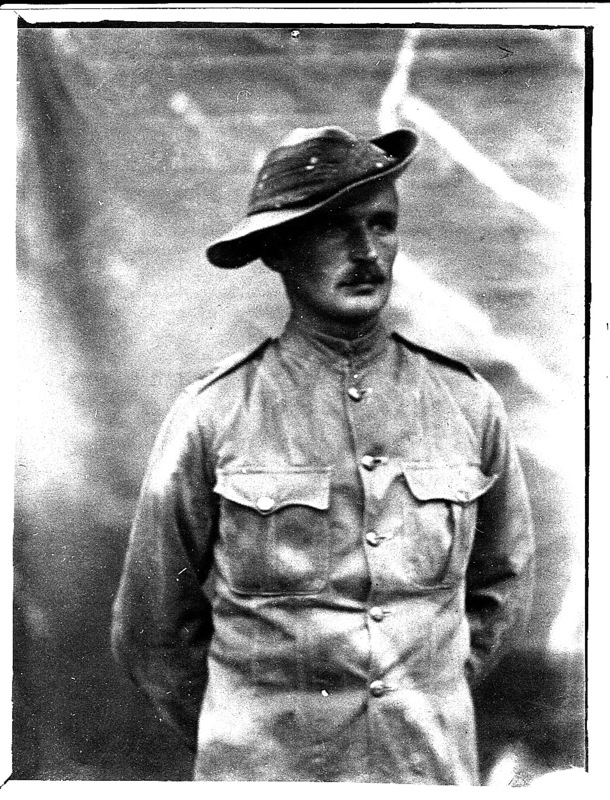 Walter Hatton had completed a two-year Engineering Course before going to South Africa. On receiving his commission as a 2nd Lieutenant in the Special Reserve of Officers, Walter Hatton was ordered to a School of Instruction at Tynemouth where he trained and received his full commission in September 1917 with the 3rd Battalion South Staffordshire Regiment. He was then attached to the 2nd Battalion for posting overseas on active service. He would have made a commanding figure at 6 foot tall. He was described as having a fair complexion, with fair hair and blue eyes. His medical examinations stated that he had perfect vision in both eyes and was not colour blind. The records also show that he survived an operation for appendicitis in 1905. 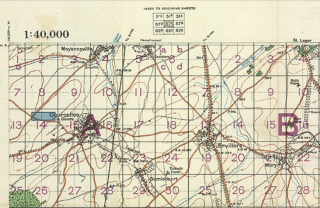 On the 22nd August 1918 2nd Battalion South Staffs had successfully captured the village of Courcelles-le-Comte on the Somme. 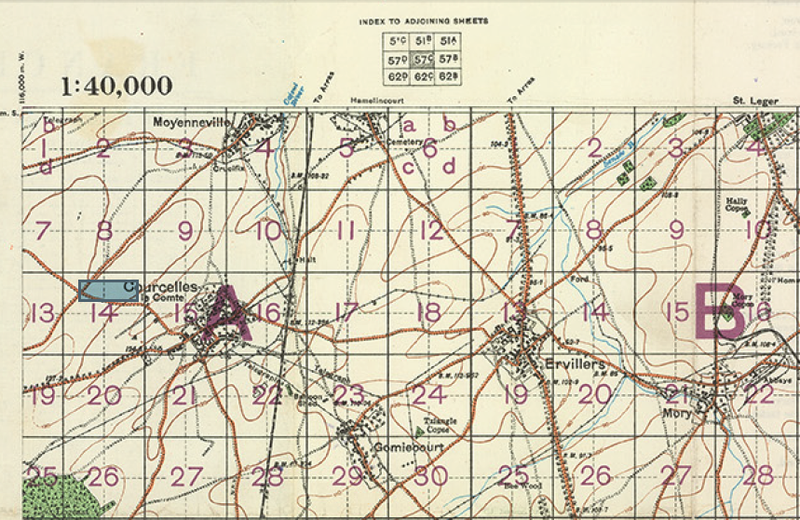 The next day they were ordered to advance north east on the nearby village of Ervillers. Zero hour was 11.00am. The 90 minute action captured 510 german prisoners, 9 field guns, 5 howitzers, 52 light and heavy machine guns. Two officers were initially reported killed: Lt. E.W. Rawson and 2nd Lt. R. Shakespeare. The Battalion War Diary has an added amendment to the officers killed – Capt. H.W.S .Hatton. It is likely Walter Hatton died when the Company came under fire as it reorganised in a trench 150 yards West of the village at noon. 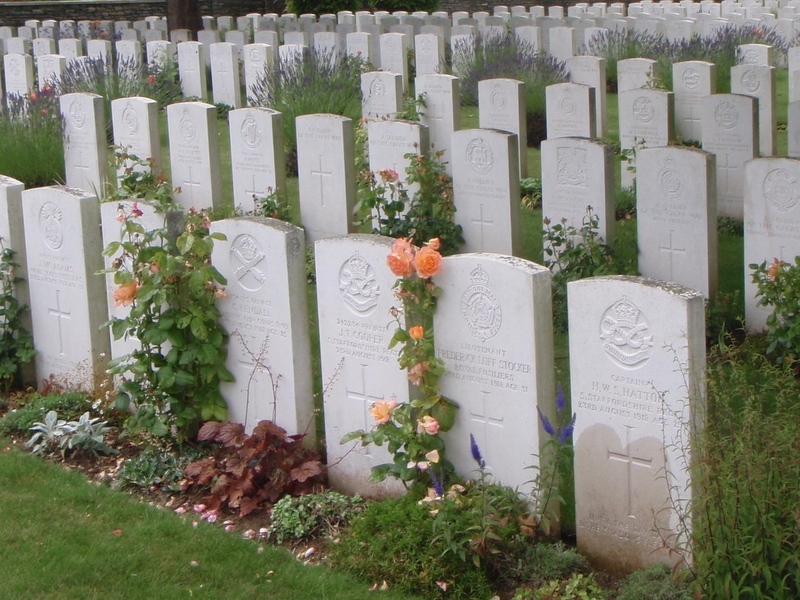 Captain Horace Walter Smeathman Hatton was listed as killed on the 23 August 1918 and was buried at the Douchy-Les-Ayette British Cemetery, Pas de Calais, France. The memorial stone has his full name inscribed as well as the lines “Until the day dawn The shadows flee away”. 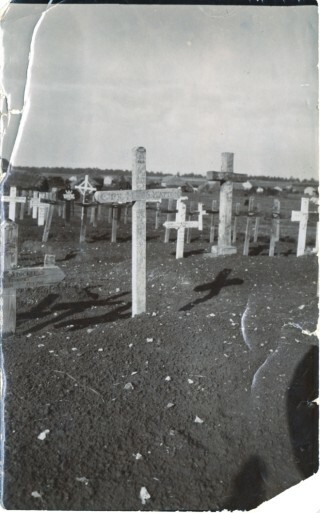 (The Hatton family have kindly made available a rare photograph of the original cross placed on his grave before any landscaping of the cemetery by the Commonwealth War Graves Commission). According to the details on his Medal Index Card, the 1914/15 Star was to be administered by the South African Authorities. The British authorities were to administer the award of the Victory Medal and the British War Medal. 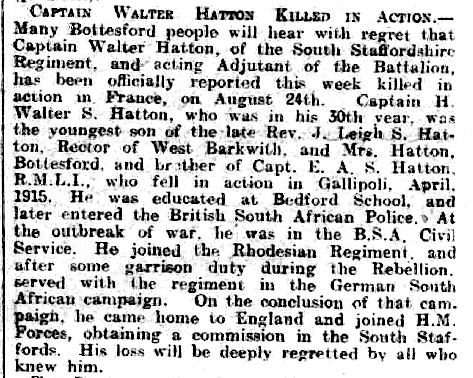 Why was Walter Hatton’s name on the Bottesford War Memorial in St Mary’s church and on the list of Bottesford men who served? Mrs Hatton had left Greenfields by 11 September 1918 and was living in the village at ‘Ye Olde House’ Bottesford. She had been assured that she was entitled to a gratuity as her son had been killed in action. 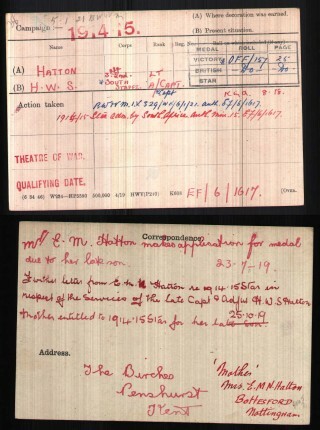 From correspondence contained in his Service Records, Mrs Hatton’s entitlement to her son’s deferred pay was another issue that was not going to be easily resolved. Retrieving her dead son’s personal belongings also proved to be difficult. They consisted of the following: 1 revolver (Colt) in holster, 1 pipe, 1 bag containing a safety razor in case, 1 key, 2 studs, 1 shaving brush, 1 tooth brush, a comb and shaving stick, 1 wallet containing letters, papers, and a 1 mark note, 1 cheque book. No one seemed to wish to take responsibility for returning these items to her. She also wished to make enquiries about his 1914/15 Star. She had had no notification that the South African Authorities would administer the award of the 1914/1915 Star in 1919. 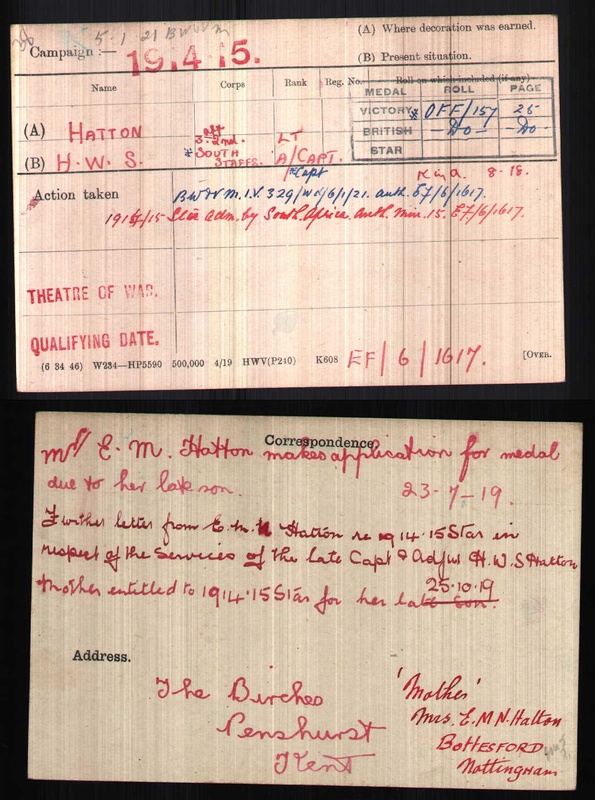 Walter Hatton’s Medal Index Card gives two correspondence addresses. The first was The Birches, Penshurst, Kent and the second was Mrs. E.M.N. Hatton, Bottesford Nottingham. It was noted that she was the mother. Other correspondence gave Overlake, St Johns, Woking as another address for Mrs. Hatton. 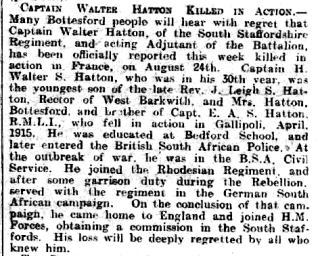 However, the Medal Index Card information shows that Walter Hatton’s mother was in Bottesford when he died. Her name as a private resident also appears in the Kelly’s Directory for 1925. Mrs Hatton died in Bottesford on 6 December 1926 and her obituary in the Grantham Journal stated that she had been resident in Bottesford for at least 10 years. As a resident of Bottesford, connections to Marsh family and her former husband’s role as a curate in nearby Orston would have proved grounds for including Walter Hatton’s name on the memorial. 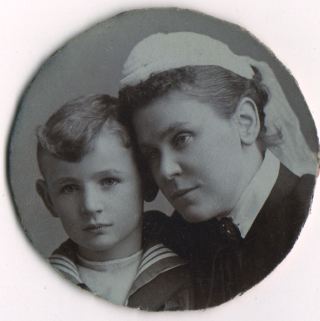 She had already lost her eldest son, Edward Allen Hatton, in the Gallipoli in 1915. Her daughter Miss Lois Caroline Hatton remained in the village until at least 1933. Her name appeared as a private resident in 1928 and 1932 Directories. It has been reported that Miss Hatton had been a matron at a school in Newbury. One of the cottages on Church Street, Bottesford (now demolished) may have been ‘the Olde House’ that Mrs Hatton moved to after living at Greenfields. It has been locally reported that Miss Hatton also had a room at 7 Church Street. Miss Hatton died in September 1973 aged 85 in Wallingford. Why was Mrs Hatton residing in Bottesford? The Rev. John Leigh Smeathman Hatton first wife was Lois Caroline Marsh, daughter of Thomas and Rebecca Marsh of Scarrington. She was born in 1836 and died in 1880 in Scarborough. John Hatton was the curate in nearby village of Orston, Notts in 1861 and the villages of Orston and Scarrington are nearby to one another. The couple were married in Bingham in 1864 and they had three children – John, Francis and one un-named. The Reverend Hatton’s daughter by his second marriage to Edith was named after his first wife Lois. There were a number of Marsh families in the area, including one family in Bottesford. Mrs Hatton was buried in Bottesford churchyard in a plot that was close to the Marsh family graves. So the family connections to the family of John Hatton’s first wife could have been the reason for Edith Hatton’s choice of Bottesford as her home. The First World War deprived Mrs Hatton of two sons. Walter’s elder brother Edward had joined the Royal Navy and was in the Royal Marines Light Infantry. In 1911 he was a Lieutenant in the RMLI on board HMS Penguin, sailing in ‘The Civil Parish of South Africa and Australia’! Edward married Olga L Peel Yates on 7 January 1914 in Tendring, Essex. Captain Hatton’s service history stated that he had been commissioned as a 2nd Lieutenant in the RMLI on 1st September 1909. He had been in the Chatham Battery at Dunkirk and at the Defence of Antwerp in 1914. According to the Commonwealth War Graves Commission Captain Edward Allen Smeathman Hatton, aged 31, was killed in action 29 April 1915 and was buried at Beach Cemetery Anzac, Cankale, Turkey. 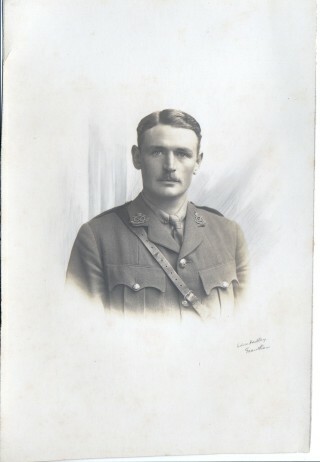 The Royal Naval Division Casualties records report that he was killed at 6pm whilst leading a counter attack against one of the British trenches that had been captured by the Turkish troops. Also recently commemorated with his brother, Captain Edward Allen Smeathman Hatton, RMLI (killed in action on the 29th April 1915 in Gallipoli) on the East and West Barkwith War Memorial, Lincolnshire. 'The Barkwiths and Panton in War' is supported by the Heritage Lottery Fund. Walter Hatton also appears on the South Africa War Graves Project (https://www.southafricawargraves.org/search/view-paginated.php?page=1&unit2=313). Both brothers also appear on the Hinton Admiral War Memorial in Dorset. 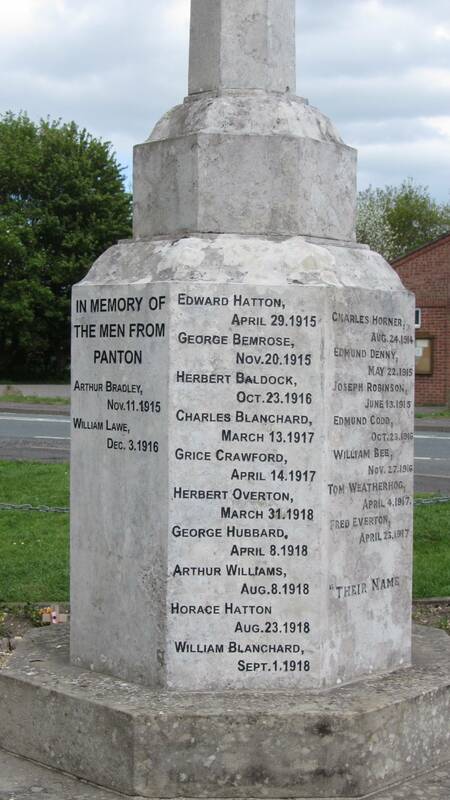 Charles Hatton (1872-1932) resided there and it is understood by the family that he arranged that their names be included on that village's war memorial.